Another genre that is very dear to me are Dutch records about people from other countries that live in Holland. I started recording all the songs that I have on my hard disc, so that I can make a CD-compilation with the highlights in this genre. One record that you sure know is ”Wij willen WW” (hm, I cannot remember the artist, but I have the record, so I will tell you the name later), but there is more. Enough for a CD! In the Radio-piraten sector there has been made quite a bit ( ”Mijn bruine broeder” ), but also Johnny Camaro, Cherry ( ”Ik ben een dame uit Suriname” ) and Gerard Cox & Frans Halsema ( ”De Surinaamse wegenwacht” ) are on my list. And how about De Zangereres Zonder Naam met ”Hij was maar een neger” ? This is going to be a great compilation. Today I re-discovered a 45 that was made in 1990 by a guy that calls himself Kahdir Abdul, but I have no idea who it really is. It is song about a Moroccan family, and all the wrong jokes are being made in a way that I find very funny. Making jokes about people from other countries is often seen as racism, but I think it is the other way around: as long as you cannot make a joke about somebody, there is racism. 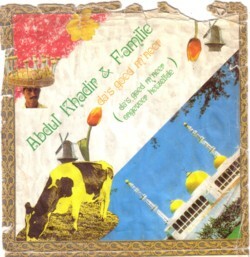 Anyway, here is Abdul Kahdir & Familie with ”Is goed M’neer” .